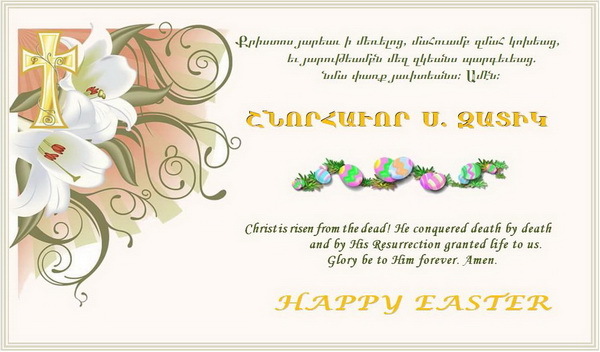 On Sunday, April 21, 2019, the glorious Resurrection of our Lord Jesus Christ will be celebrated in all Prelacy Churches. H.E. 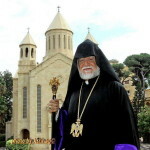 Archbishop Moushegh Mardirossian, Prelate, will celebrate Easter Divine Liturgy at St. Mary’s Church in Glendale, and H.G. Bishop Torkom Donoyan, Vicar General, at St. Garabed Church in Hollywood. The services start at 10:30 a.m.
On Monday, April 22nd, in honor of Easter Memorial Day, requiem service will be conducted at Forest Lawn Hollywood Hills “Hall of Liberty” and Forest Lawn Glendale “Church of the Recessional” presided by the Prelate and with the participation of clergy members. 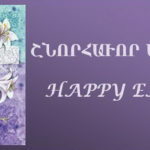 The services begin at 10:00 a.m.
On Thursday, April 25, Easter will be celebrated at Ararat Home in Mission Hills with Divine Liturgy and special services. The celebration will begin at 10:00 a.m. with a special service at the Nursing Facility. 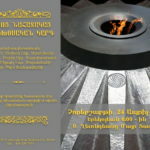 Divine Liturgy will follow at the Chapel, celebrated by Rev. Fr. Ardak Demirjian, who will also deliver the sermon. Afterward, the blessing of the home service will be conducted at the Assisted Living Facility.